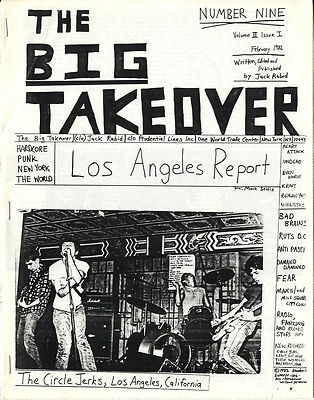 THE Big Takeover Magazine US Rock/punk/grunge back issue Very rare early 10 pages. The very first of the fanzine style xerox issues 1982 #9 Circle Jerks, Heart Attack, Kraut, Reagan Youth, Damned Undead Bad Brains Ruts DC Fear and lots of other groups featured including LP & singles reviews and Live gig reviews etc. Excellent condition. Will be posted in a strong cardboard envelope.